Ardyth Plumb Grap, age 88, passed away January 22, 2018, at Fox Run where she resided. Born August 5, 1929, on the family farm of Herman and Minnie (Koenig) Franke. Ardyth was the youngest of seven children all born on that farm. She was united in marriage to David Plumb in 1951 and to this union daughters Connie and Linda and son Steve were born. Ardyth worked and retired from Iowa School for the Deaf in the Housekeeping Department, and was a lifelong member of St. Paul Evangelical Country Church. Her hobbies included decorating wedding cakes, gardening, growing flowers and canning. Ardyth is known for her sense of humor and her jokes. She is preceded in death by her parents; husband, David Plumb in 1980; daughter, Linda Plumb in 1999; sisters, Marie Hackney, Loretta Schoening; brothers, Glen, Emmet and Dale Franke. In 1991, Ardyth was married to Ed Grap. Survivors include husband, Ed; daughter, Connie (Mike) Peters; son, Steve (Teresa) Plumb; grandchildren, Eric (Tayler) Plumb, Kyle (Mary) Plumb, Scott Plumb, Chad (Becky) Guilliams, Cory Guilliams; great-grandson, Collin Guilliams; great-granddaughters, Addison and Charlie Plumb; step-children, Aaron (Jan) Grap, Eric Grap; step-grandson, Zachary Grap; sister, Geneva Schmielau. Funeral service was held last Thursday, January 25, 2018 at 10:30 a.m., at St. Paul Evangelical Country Church, Council Bluffs. Interment followed in the church cemetery. 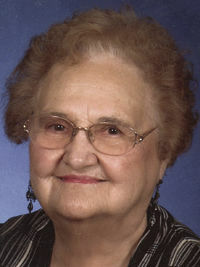 Cutler-O’Neill-Meyer-Woodring Funeral Home handled her funeral arrangements. Thanks to Cutler-O’Neill-Meyer-Woodring Funeral Home, Deb Heup and Roselia O’Neal for the information.